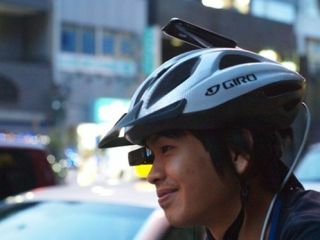 A Japanese company is developing a prototype cycling helmet that uses the Apple iPhone to connect to a heads-up display, to show you where to go as you're biking around town. Leaving aside questions of safety and fashion, this is perhaps one of the coolest iPhone mods we have yet seen. The display is a Scalar T3-A which shows your iPhone mapping data in the corner of your eye. The HUD is retractable and your iPhone is mounted on to the top of the helmet. No protection for the phone has yet been developed, so the guys testing out this prototype better hope they don't get run over in the rush hour traffic! Note that the key word above is 'prototype' – no word as yet on whether or not such a device will ever see commercial release. However, if it doesn't, then we plan to obtain the design plans from the developer and make one ourselves in the garage. Don't believe us? Watch this.